1. Use a little of the melted butter to brush the base and sides of a 20cm springform pan. Line the base with baking paper. 2. Dissolve gelatine in 2 Tablespoons hot water. Set aside. Crush the biscuits in a food processor. Combine remaining butter with biscuit crumbs and press into the base of the pan. 3. Place egg yolks, two-thirds of the sugar, the mascarpone and the seeds from the vanilla bean in an electric mixer and beat until pale. Add the gelatine and whipped cream. Beat eggwhites and remaining sugar in a bowl until stiff peaks form, then fold into the cheese mixture. Spoon over the base, then refrigerate overnight. 4. To make the toffee sauce, place all ingredients in a pan over low heat, stirring to dissolve the sugar. Then increase heat to high and cook for a further 2 minutes. Set aside to cool, then refrigerate for 2-3 hours before serving. 5. 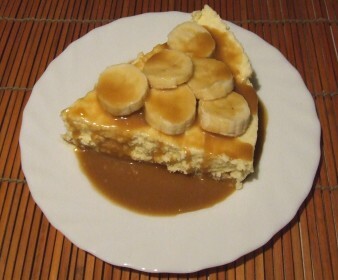 To serve, arrange banana slices on top of the cake and drizzle with the sauce. I used “morish” macadamia biscuits for the base. I also doubled the base. Next time will use a lot less butter in it though as I had to use paper towels to squeeze out all the excess.